Lamptron FC5v2 design is simple and neat. Front panel is made of a chunk of aluminum 4mm thick. 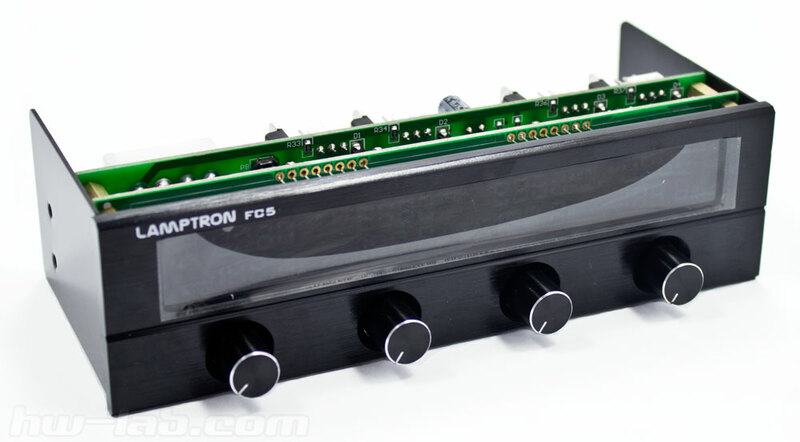 FC5v2 dimension involve controller installation inside 5.25″ bay of you PC case. As you may already mentioned, we have received version with black anodized front panel. The controller boasts greatly of its new significantly enhanced (compared to version V1) LCD display. Similar devices offend display information in two colors (black/white), whereas Lamptron FC5v2 does it with multiple colors, although each can be selected one at a time. The 12.6 cm display is sunk inside the front panel by 2mm and covered with dust proof tape. Below it, there are four dials for fan speed adjustment corresponding to four fan channels. The distance between dial is about 22mm which is quite enough to set the speed preciously without changing setting for neighboring fan channels. All the electronics of Lamptron FC5v2 is located on two PCBs. 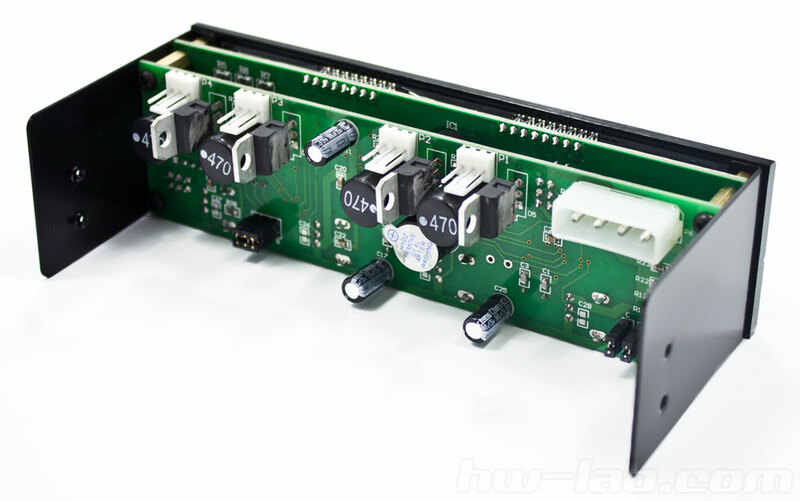 The first one includes LCD control components, while the second one hold the electronics for fans control channels. The last also features all the power (4-pin Molex) and fan (3-pin)connectors.Each of fan connectors has a power transistor located near it. Note, that there are no heatsinks on power elements bearing in mind each channel can hold at 30 W o, which means developers did a great job on component andschematics selection while making this device. We could not identify the model of power elements Lamptron uses for FC5v2, because the manufacturer has erased the marking of the chips deliberately. As we said, the back PCB featuresfour 3-pin (P1, P2, P3, P4) fan and one main 4-min Molex (P6) power connector. Besides that, there are other controls. The backlight of display is even which make all the figures acer clearly readable on the screen. Specified colors names correspond to the real ones almost completely, however, white includes some of purple tint. On the other hand, the backlight is so strong that even screen ends covered with light absorbing material still show the light through. One can fix it by filling the ends with a permanent black marker.